Video review of worldwide known Puma Bowie hunting knife made in Solingen – Germany. 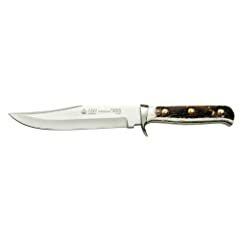 Bowie blade is made of high corrosion resistance 440C stainless steel. Handle is made of staghorn and classic sheath of brown leather. Welcome to this video in which we are going to show and make a short review of a Puma fixed knife called Original Bowie. As you can see, this knife is made by famous Company Puma, based in Solingen Germany. Solingen is a city in Germany, which is most famous for knife making over centuries. And Puma is one of, how to say, really well-known companies for this city and is mainly specialized in hunting knives. Which are precisely made, mostly handmade and have a really high quality. This original Bowie is also handmade. It comes with a certificate, which shows when knife was made, this particular piece was made in 2013, it also shows all the instructions how to sharpen the knife, how to use knife, about warranty information, everything what you have to know about your knife, when you buy one. These instructions are in English and in German. The knife itself comes in really nice leather, dark brown sheath, which has also a sling for attaching it to the leg or you can also attach it to your belt and then on your leg. It has interesting two safeties for the knife, so even if you unleash this traditional safety the knife still stays in the sheath, so you have to remove this sling and here you go. This is Original Bowie made by Puma. You can see here, each knife gets measured for the hardness. It was tested here, before it leaves the company. And as you can see, this knife is quite big, it is long, not too heavy and has a traditional Bowie design. It is almost, well it is 28 centimeters long, the blade itself is 15.5 centimeters long, it has a thickness of 4 millimeters and is a one piece, full tang design. The blade goes from here all the way to here, to the end of the handle. It weight 200 grams and is made of 440 C stainless steel, it has a satin finish and for handle material a natural stag horn is used. It has really nice finish and is very durable natural material. Smooth, as you can see in some parts this material is polished, it is not satin anymore like the blade. So it was really a lot of attention was invested in the details in this knife, when it was produced. The knife is handmade, so you can that every piece has some unique features. The knife also has a steel bolster, here, between the handle and the blade. And it has a brass sling hole, and brass bolsters for the handle. It is robust, reliable but still precisely handmade knife made by Puma in Solingen Germany. So, this was a short review of Puma Original Bowie and for more information, please click the link below in the description window of this video. Staghorn is a very bad material for knives. The handle is humpbacked and crooked with a bad feeling in a hand because of its used rivets. It also collects dirt, dust and bacteria like no other material. The knife looks like your Bowie Original except for the Bolster, Oh, and it’s not a Hollow Grind but appears to be a Saber Grind or a Flat. 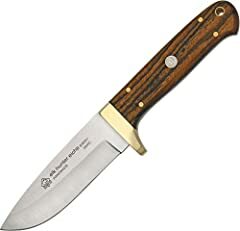 My favorite knife , please do a review on 116375 PUMA White Hunter ! Great video buddy, thank you! I love the Puma products. German made! 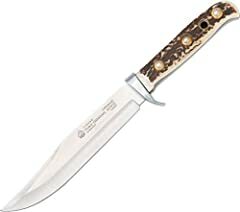 Say Heah, I recently, actually about a week ago, I bought a Puma Bowie, It’s actually a good looking knife, But with ought the Bolster and the Pommel is plain but the lanyard hole extends out of the pommel a little. The Knife doesn’t have any country of origin, but it is etched Solingen Germany and on the box (black) it says Handmade in Forman and English, I read somewhere that it was made on the second half of 2002. But mine is in mint condition, both knife and sheath and I have the original box and the #118396 match’s the knife number stamp and on the box. I was just wondering if you would know if my knife is 440c, 440a., or 4.116 Krupp Stainless. I can’t find any info on it anymore than I know about it. Judging by the Sheath which is a very quality looking sheath. It’s like a simpler trimmed down Bowie. I actually like it. It looks like a well made but simple knife. I like it and that’s all that matters, But I would be interested knowing what the blade steel is. Any info would greatly be appreciated. Thanx in advance. One more thing, On my Puma 2, The grind appears to be a Saber Grind instead of a Hollow Grind which is ideal what I use my knives for in the bush, I work wood more then I would to dress game. Actually I already teamed my Puma Bowie 2 with my Gerber Freeman Hunter and the Caper both with stag handles and in S30V actually a very nice match by just how the knives are made without bolsters and just blade and the stag Slabs. Again if you can help please and Thank You. Hi I have a question in one of your reviews you were saying on the paper in side because it says puma and also puma IP that means it was put together in Spain ? Is that true as well for the Puma Bowie Knife in this video ? I ordered one yesterday , a few weeks I have to wait !